G-PIXE, Colt 31A, built 2000, 35 hrs. Turning vents, See-Safe windows in parachute. Fabric in exellent condition, light scorch marks on nomex. Cameron Chariot 1-person bottom end, built 2000, 35 hrs. Blue leather finish. Cameron Mini Single Shadow (CB2548), built 2000, 35 hrs. Liquid pilot lights, REGO fittings. Cameron H30 horizontal cylinder, built 2000, 35 hrs. Usable volume 55 liter. REGO fittings, 2x quick shut off valve. PRV/PPT/INT valid until 09/2020. Ultramagic 3.0 HP inflation fan with Honda GX100 engine, carbon fiber propeller. Envelope weight 60 kg. Seat, burner and empty cylinder weight 49 kg. In excellent condition. ARC valid until 30/07/2019. Will not split. G-CJUO, Cameron Z-42, built 2017, 7 flights, 6:05 hrs. Turning vents. Envelope weight 60 kg. 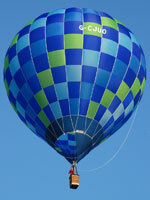 Cameron CB3037 '56 lite' basket, built 2012, 49 flights, 47 hrs. Black leather top rim, cushion floor, fire extinguisher in pocket, pilot restraint anchor, attachment for external tanks if preferred. Inside dimensions 65cm x 55cm. Basket weight 35kg. Cameron CB2130 Shadow single burner, built 2012, 49 flights, 47 hrs. Hoses dated 03/2016. Liquid pilot lights, REGO fittings, black burner bag. Cameron 2.1 HP inflation fan, built 2017, with carbon fiber propeller. All in excellent condition. ARC valid until 17/01/2020. Immediately available. 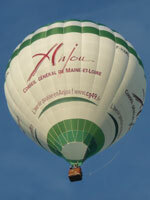 07JT (French Ultralight), Chaize Dynabulle, built 2003, 95 hrs. 1.350 m3 / 47.000 ft3. Turning vents. With duo seat bottom end, built 2003, 95 hrs. 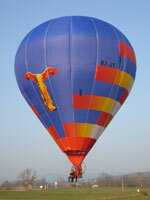 Leather trim, drop line, with thrust assembly with Zenoa Thermal engine 250 cm3. Lindstrand single burner, built 2003, 95 hrs. Hoses replaced in 2013. Liquid pilot lights, height adjustable frame. Cylinders optionally available. SP-BIV, Kubicek BB22, built 2000, 485 flights, 502 hrs. 2.200 m3 / 77.000 ft3. Raven Europe S55A basket, built 1991, brown leather top rim, cushion floor, fire extinguisher, drop line. Aerostar HP VI D double burner, built 1991, hoses dated 08/2016. Liquid pilot lights, 4x Worthington cylinder, slave, built 1991, 3x POL (Raven) fitting, 1x REGO fitting. PRV/PPT/INT valid until 08/2023. Honda 6.5 HP inflation fan, flip wheel frame, wooden propeller. Ford Transit van, built 2002, 69.000 km, adapted to carry balloon. 3.0m single axle trailer. Flytec 6040, Garmin GPS Map60CX, 2x Motorola 2-way radio, old Icom air band radio, Panasonic CF-19 Toughbook. ARC valid until 08/2019. 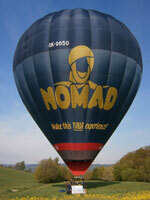 OO-BHO, Lindstrand LBL 90A, built 2000, 600 flights, 650 hrs. Hyperlast top (3 rows). 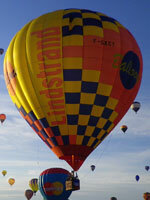 Lindstrand LBL size 3 basket, built 2000, 650 flights, 700 hrs. Red suede top rim, cushion floor, drop line, fire extinguisher. Outside dimensions 1.55m x 1.10m x 1.20m. Lindstrand LBL Jetstream double burner, built 2000, 650 flights, 700 hrs. Liquid pilot lights, REGO fittings. 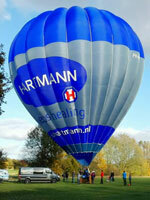 4x Lindstrand LBL V20 cylinders, built 2000, 650 flights, 700 hrs. 2x Master, 2x Slave. REGO fitting, quick shut off valve, red cover. PRV expired, PPT/INT valid until 2025. Honda 5.0 HP inflation fan (Lindstrand), built 2000. Flip wheel stainless steel frame, wooden propeller. 2.5m Single axle Westfalia trailer, built 03/2000, braked, MTM 1400 kg. Quick release, Flytec 3040 + TT34. Envelope not flow since 2013, bottom end not flown since 09/2014, ARC expired since 08/06/2015. F-GZYB, Pilatre de Rozier MA-26, built 2005, 300 flights, 267 hrs. 2.600 m3 / 90.000 ft3. Hyperlast top (parachute + 2 rows), regular parachute. Velcro for banners. 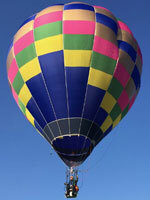 Cameron CB300-4A aristocrat basket, built 1999, 345 flights, 342 hrs. Black leather top rim, cushion floor, side wall padding, fire extinguisher, drop line, pilot restraint harness. Cameron Shadow double burner, built 1999, 345 flights, 342 hrs. Hoses replaced 6 years ago. Liquid pilot lights, REGO fittings. 4x Worthington cylinders, built 1999, 345 flights, 342 hrs. Black cover, REGO fittings, quick shut off valves. PRV/PPT/INT valid until 2019. 8.0 HP inflation fan (homebuilt) with Honda engine, wooden propeller. Homebuilt single axle trailer. Can be delivered with new ARC. 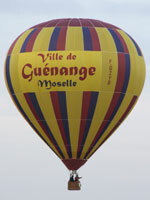 F-GZMC, Kubicek BB26Z, built 2007, 255 flights, 272 hrs. 2.600 m3 / 90.000 ft3. 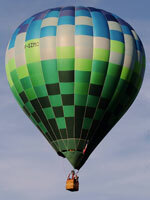 Ultramagic C3 basket, built 2007, 255 flights, 272 hrs. Brown suede top rim, fire extinguisher, drop line. Inside dimensions 1.30m x 1.10m. Ultramagic MK-21 double burner, built 2007, 255 flights, 272 hrs. Liquid pilot lights, REGO fittings, hoses dated 10/2017. 4x Worthington cylinders, slave, REGO fitting, PRV/PPT/INT valid until 04/2026. 9.0 HP inflation fan, built 2007, stainless steel flip wheel frame, wooden propeller. 3.0m single axle Westfalia trailer, built 1995, max load 1200 kg. ARC valid until 04/2020. F-HAML, Cameron Z-105, built 2009, 375 flights, 340 hrs. Hyperlast top (6 rows). Sky BT2500 basket, built 1998, black suede top rim, drop line, fire extinguisher. 1.55 x 1.20m. Lindstrand Jetstream series 2 double burner, built 1999, liquid pilot lights, REGO fittings, hoses valid until 03/2023. 2x Schroeder VA70 cylinders, built 2006, REGO fitting, quick shut off valve, black cover, fuel safe coupling on bleedvalve. PRV/PPT/INT valid until 06/2026. 5.5HP inflation fan, wooden propeller, black steel frame, Honda engine. Lindstrand quick release with eyed rope and karabiners. Suivit single axle trailer, built 2013, max load 950 kg, platform dimensions 3.00m x 1.50m, roller on rear. ARC valid until 06/2019. 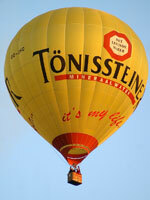 F-GXCT, Lindstrand LBL 120A, built 2004, 376 flights, 335 hrs. Hyperlast top, turning vents. 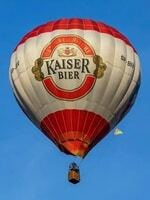 SkyBalloons basket, 1.55m x 1.25m, black leather top rim, cushion floor, drop line, fire extinguisher, first aid kit. Lindstrand Jetstream double burner, liquid pilot lights, REGO fittings. 2x Thunder & Colt V30 cylinders, built 1986/1987, REGO fitting, QSO valve, black cover. PRV/PPT/INT valid until 2026. 8.0 HP inflation fan, stainless steel flip wheel frame, wooden propeller. Single axle trailer with polyester cover. ARC valid until 02/04/2020. OK-9650, Cameron Z-160, built 2004, 593 flights, 648 hrs. Hyperlast top (which was replaced at 50 hrs), RDS, turning vents. Turning vents have been replaced in 2018 by Cameron Bristol. Cameron CB-991/F single T basket, black suede top rim, side wall padding, cushion floor, fire extinguisher, drop line. Cameron Sirocco double burner, liquid pilot lights, REGO fittings, in frame with metal heat shield. 4x Schroeder VA50 cylinders, built 1998, approximately 700 flights/hrs. REGO fittings, master, red cover, PRV/PPT/INT valid until 2020. In top condition, inspected by Cameron Bristol. ARC valid until 03/2019, can be sold with fresh ARC.